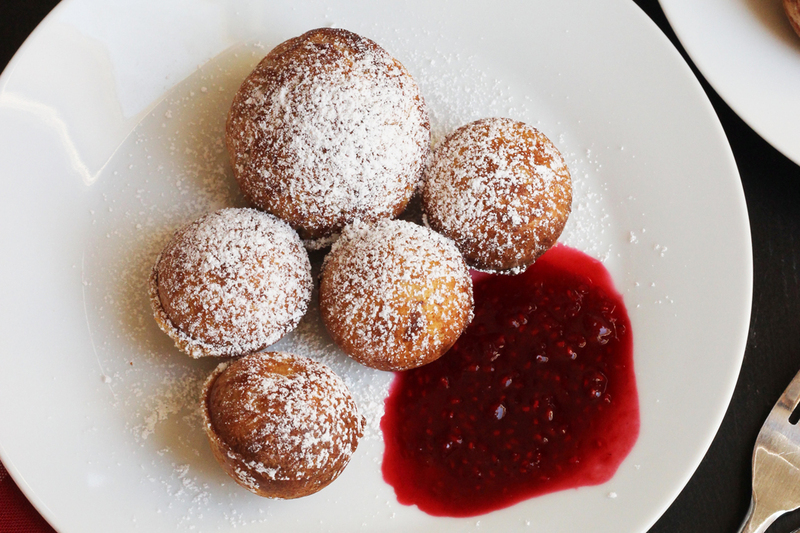 Enjoy a traditional Danish treat when you make Aebleskiver with raspberry sauce. This simple recipe includes whole wheat flour and vanilla to enhance the “pancake puffs”. When I was a kid, one of our regular family outings was a trip to Solvang, California. It’s a little tourist town, inspired by Danish culture. Whenever relatives came to visit from the Midwest, it was inevitable that we would make the trek to Solvang, about 2 1/2 hours from my parents’ house. Funnily enough, I ended up going to college about a half hour away from Solvang and played the tourist there with college friends. My sister Janel, and her husband bought their first home in Solvang. And today, my inlaws live about a ten-minute drive from this busy little town. 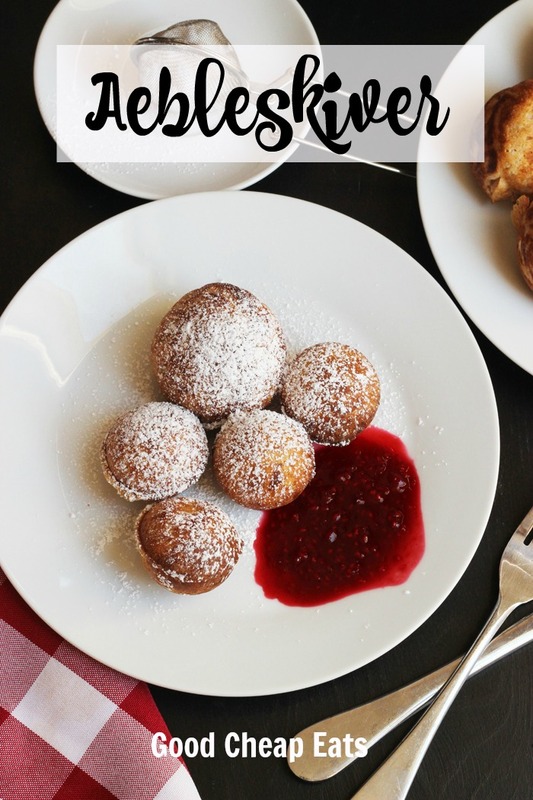 One of Solvang’s claim to fame is the delectable Danish pancake, the Aebleskiver. It’s basically a ball-shaped pancake with a taste similar to a waffle. I remember going with Gramma John to the little Solvang hardware store to buy an aebleskiver pan. My mom has one. Janel upgraded to this fancy-pants aebleskiver pan (pictured). I have a cast iron aebleskiver pan. It’s a family thing, apparently. While you do need special hardware to make aebleskiver, it doesn’t have to be an aebleskiver pan. Ha! We found out this summer that a cake pop maker works just as well. If you’ve got a cake pop/donut hole maker gathering dust somewhere, brush it off and make aebleskiver. Or if Santa wants to give you a fun gift, ask for a genuine aebleskiver pan. My two cents: the aebleskiver pan is traditional, but baking them in the cake pop maker is easier and hands-free. However, the cake pop size puffs are somewhat smaller than the traditional ones. Choose your poison. When I make these I use whole wheat flour and a dash of vanilla in an adaptation of my sister’s recipe. They are delicious both ways, just be sure to serve them with powdered sugar and homemade Raspberry Sauce. Aebleskiver tend to be very popular near Christmas time, similar to the lefse that my Gramma John used to make at the holidays. Now’s a great time to try these out! In the bowl of a stand mixer, beat the egg whites until stiff. In a large mixing mixing bowl, combine the buttermilk, egg yolks, butter, and vanilla extract. In another mixing bowl, whisk together the flour, sugar, baking powder, salt, and baking soda. Add the buttermilk mixture to the dry mixture and stir until smooth. Fold in the stiff egg whites. 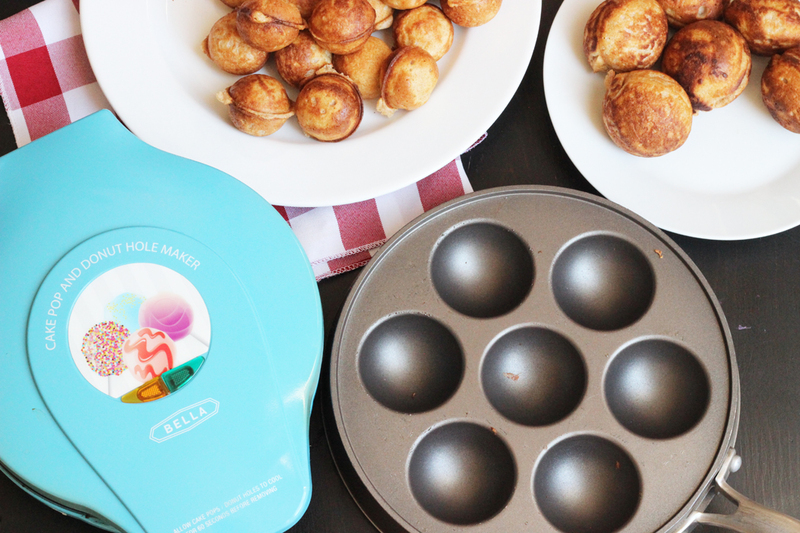 Heat the aebleskiver pan or cake pop maker. Brush the cups with melted butter. Fill the cups and cook. If you are using an aebleskiver pan, once the bottoms are cooked, use a skewer to turn them over and continue cooking. They will form a ball-shaped pancake. If you are using a cake pop maker, follow the manufacturer’s directions. Alternatively, you can bake this batter in a waffle maker. It won’t be an aebleskiver, but it will be delicious. 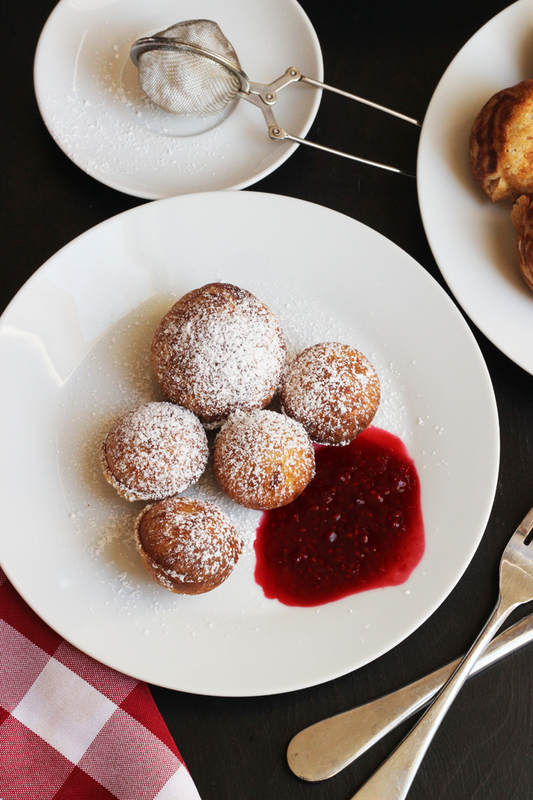 Serve aebleskiver with powdered sugar and raspberry sauce. I think it is funny, when I see traditional Danish food made in other countries 🙂 I’m not really THAT crazy about æbleskiver and I don’t own an æbleskivepan, but I am thinking about buying one 😉 Luckily, you can buy æbleskiver frozen and just heat them in the oven, and if you get the organic kind, they are actually quite good! There are a lot of different recipes for æbleskiver, and some include apples, grated or diced. But you are right, most people don’t add apples anymore. I was thinking about you when I was writing this, Kathy, and wondering what the real story was. LOL! The Danes in Solvang swear by raspberry jam. I wonder how that got tweaked. Thanks for giving us authentic input! Happy Holidays to you! Oh dear, I have a pan; completely forgotten about it ! Thank you for reminding me 🙂 Great breakfast or dessert. Have a happy holidays ! I grew up going to Solvang too. We always looked forward to going there. I love æbleskiver (My mom was Swedish and she spelled it with out the A) I have 2 cast iron pans because they get eaten up quickly in my house. We have powered sugar, strawberry jam or maple syrup with them. Thanks for a “different” recipe. I’m going to try yours. It will be after the new year because we are booked until then. Something for me to look forward to in 2017.